The fight to curb the proliferation of fake news has been an uphill battle. But UC Riverside researchers have developed an algorithm that they say works with 75 percent accuracy to root out misinformation. Ultimately, the tool may one day be incorporated into user newsfeeds to filter out fake news reports. Their efforts recently received a funding boost from Snapchat, allowing researchers to continue improving the algorithm's accuracy. The university's Multi-Aspect Data Lab, which is working on the project, acquired a $7,000 donation from the research wing of Snap Inc.
What makes UC Riverside’s research different to the dozens, maybe even hundreds, of other research projects trying to break the fake news cycle is the ambition of the project. It’s not a simple keyword blocker, nor does it aim to put a blanket ban on certain URLS. Nor, perhaps most interestingly, is it particularly interested in the facts contained in stories. This makes it distinct from fact-checking websites like Snopes, which rely on human input. So how does it work? The algorithm first analyzes an articles’ structure to look for certain patterns that indicate a story may be fake, according to computer scientist Vagelis E. Papalexakis, who directs the lab. The algorithm then groups together articles that are potentially fake. Machine learning, a form of artificial intelligence, is then applied to the process with limited human oversight. "The method requires a small base knowledge of articles labeled by people from which it learns and sorts other articles," according to a statement from the university. "But the approach requires far fewer human-annotated articles than current methods." Researchers tested the algorithm by ingesting tens of thousands of articles -- some known to be real, some known to be fake. They found that it accurately categorized fake news reports 75 percent of the time. 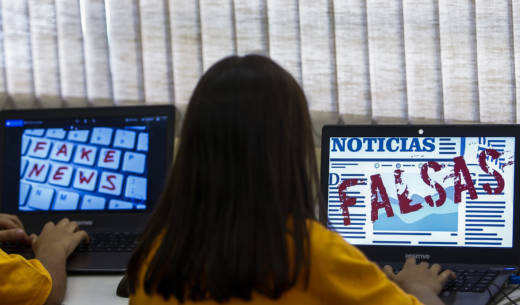 Relying on technology alone to distinguish fake news probably won't work, according to Papalexakis, since humans make subjective decisions about the information they read. His primary aim is to create a tool that helps people make better informed decisions about the stories they encounter.